This book has a 4.4 rating with over 4000 people rating it- this is one of the highest I have ever seen on Goodreads- this book must be amazing! "Wow, what a book! Historical fiction at it's very best." Ruta Sepetys has put together a taut and gripping novel that has as it's backdrop the harrowing exodus of German and Baltic civilians from the Red Army advance into East Prussia. This brilliant novel shines a light on one of the war's most devastating—yet unknown—tragedies, the sinking of the Wilhelm Gustloff where by one estimate, 9,400 people died, which makes it the largest loss of life in a single ship sinking in history. It is told from the point of view of four young people who fate has thrown together. Joanna is a Lithuanian refugee who has learned nursing skills by tending the wounded. Florian is a Prussian apprentice to an art restorer. Amelia is a fifteen year-old Polish farm girl fleeing the horrors of war. Alfred is a German sailor looking for his first trip to sea. 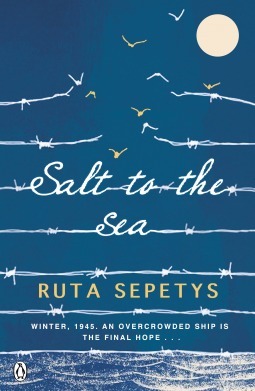 In Salt to the Sea, these four young adults, are drawn with their own rich backstories and secrets, as they trek across the war torn lands of Poland, East Prussia, Germany, and Lithuania, to alleged salvation aboard the repurposed cruise ship, the Wilhelm Gustloff. The story is told in short chapters, some as short as a single sentence, that alternate between the four main characters. Much of the action takes place before they board the ship that will take them to their meeting with destiny. The horrors of war are on full display here. The author does not shy away from the brutality of sexual assault, murdered children, and victimization of cultures, class, and race. For a YA novel, I applaud Sepetys for going all the way, and not sugar-coating the atrocities of these accounts, but keeping firm to historical accuracy. In the end, it left me wanting to learn more about the ill-fated voyage of the Wilhelm Gustloff. It truly speaks to an author's skill, when you finish a book and want to stay up and do your own "homework" and your own research. Please, give them a voice.Every nation has hidden history, countless stories preserved only by those who experienced them. Stories of war are often read and discussed worldwide by readers whose nations stood on opposite sides during battle. History divided us, but through reading we can be united in story, study, and remembrance. Books join us together as a global reading community, but more important, a global human community striving to learn from the past. What determines how we remember history and which elements are preserved and penetrate the collective consciousness? If historical novels stir your interest, pursue the facts, the history, memoirs, and personal testimonies available. These are the shoulders that historical fiction sits upon. When the survivors are gone we must not let the truth disappear with them.